April's Million Mile Month is a challenge to complete one million miles of physical activity, together as one global community. Proceeds from your registration enable school children and low income families to participate for free. There is no required fee. Your registration donation is tax-deductible, supporting HealthCode, whose mission is to empower people to live healthier, happier lives. 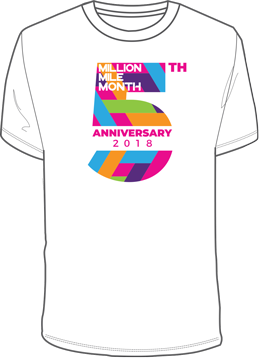 All levels include the Million Mile Month Challenge, an account on HealthCode’s activity platform and, when posting the MMM Race Bib on social media, entry to MILEstone prize giveaways. 5th Anniversary t-shirt included at the Gold/Platinum levels; allow 30 days for delivery. I want to be a Health Champion and support healthier kids, families, and communities. We understand not everyone can pay and invite you to enter any amount, $5.00 suggested.